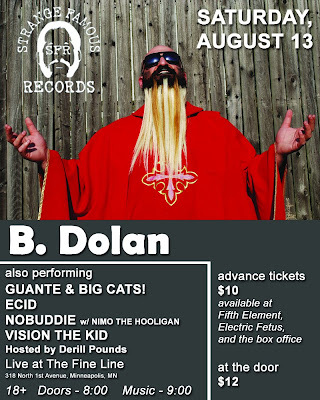 If you think Dolan is just a Sage Francis clone, you need to check this one out with an open mind, because there's a world of difference between the two. Both are big guys with beards, and both combine political messages with personal drama and a smartass attitude, but Dolan is much more of a pure spitter, and his voice is fuller and more powerful. This album has the ambition of a weirdo-indie-rap concept album, but that ambition is backed up by a rock-solid delivery and production (courtesy of Alias) that bangs as hard as anything coming out of the boom-bap traditionalist camp these days. Definitely one of the most slept-on albums of last year. So I hope you can come to the show. I don't have a whole lot on the calendar locally for a while, so if you're going to come out, this is the one to go to. Guante, very cool video! almost felt like i was there! fine collaboration!